Take a look at the current stock on our website and identify the vehicle you are interested in purchasing. Have a think about the country/port you want the vehicle shipping to, as we will ask for this information when we speak to you. 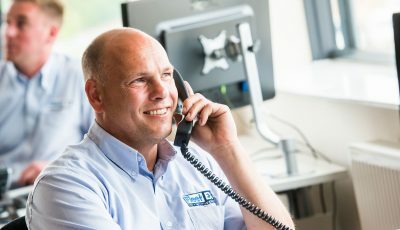 Our sales team are available to help six days a week and can be reached by either phone or email. To chat to a specific team member, just visit the contact page to find their details. They will be able to give you more information on your chosen vehicle and the shipping procedure to the selected destination. Once you have agreed on the vehicle price and the shipping logistics, the relevant team member will email you a proforma invoice containing our bank details. Once you have paid the amount in full, we will arrange the delivery of your truck to the UK port, to be shipped on the next available vessel to your chosen destination. Approximately a week after the vessel containing your vehicle leaves the UK port, we will send to you all of the documents needed for you to register and collect your vehicle. These will be posted to you via a DHL tracked service and we will also forward you the tracking number via email to ensure the documents get to you. The final thing you will need to do is to arrange customs clearance and collection of the vehicle once it arrives safely at your chosen destination. To help with this, you can appoint a clearing agent in your country. Once you have agreed on the price of the vehicle/shipping with your sales representative, they will send to you a pro-forma invoice with a breakdown of all costs. You will need to pay for your vehicle in full before we can ship it to you. The most common way our customers pay is via bank/wire transfer. Once you have made the transaction, please send your proof of payment to us by email so that we can start to prepare your vehicle(s) for transport. Please note that we do accept all major debit and credit cards - fees apply. We do also accept deposits of £500 to be paid by telephone with no fees, however larger amounts will need to be paid with the cardholder present on-site. We are happy to reserve any vehicle for a maximum of 4 weeks with just a small deposit. Please get in touch with our sales team and they will be able to give you more information on our reservation procedure.